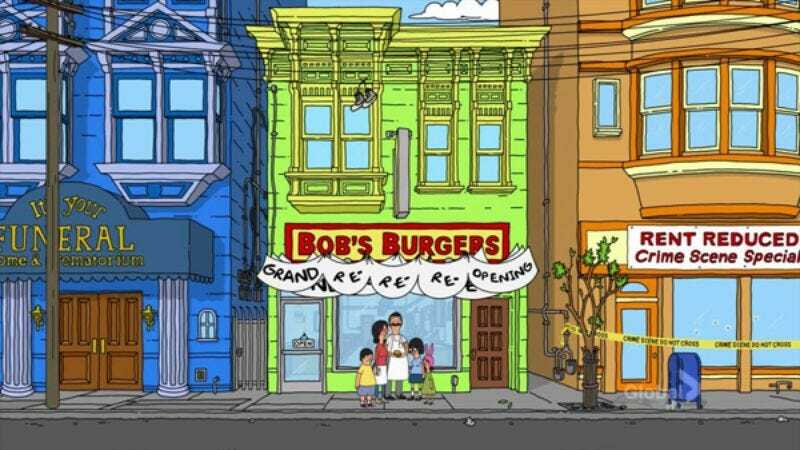 The Belchers on Bob’s Burgers are many things—perverse, hilarious, given to anthropomorphizing uncooked meat and writing incredibly obscure food puns—but one of the things that defines them is that they’re poor. The family is constantly hovering just above the poverty line, and the need to make the restaurant sustainable drives the plots of multiple episodes. Indeed, part of the reason Bob’s eccentric, condescending landlord Mr. Fischoeder (played with gleeful contempt for the common man by Kevin Kline) can push our hero into strange scenarios like renting out his family for Thanksgiving is the leverage he holds by being the guy who collects the rent on the family’s business/home. Which brings up the question: How much would that rent be? A new chart, created by Laura Allan for real estate blog Movoto, tries to answer that question using a mixture of research, deductive reasoning, and good old fan-wanking to figure out where the Belchers live, the square footage of their rental property, and how much they’re probably paying each month. The final answer is a staggeringly high $3,927 per month, which might—if it weren’t a number cobbled together from guesswork, real estate averages, and using a little girl in rabbit ears as a unit of measurement—explain why the family is always in such dire financial straits. You can read a longer blog entry explaining some of the logic behind the numbers chosen here.